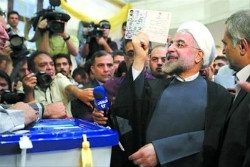 Last week, voters in Iran elected 64-year-old Shi'ite clergyman Hassan Rowhani president. The reform candidate had criticized Iran's current president, Mahmoud Ahmadinejad, and repression of civil society. Days before the vote, Mr. Rowhani promised Iranians he would bring major changes. President-elect Hassan Rowhani had not been considered likely to win. But, Iranians gave him more than 51 percent of the vote. He described the election as a "victory of moderation over extremism." He promised to undo all of the locks that he said had been placed on the Iranian people in the past eight years. Western diplomats have praised the new president for his diplomatic skills when he served as Iran's chief nuclear negotiator. Mr. Rowhani resigned that position after the election of President Ahmadinejad. Negotiations over the country's disputed nuclear program did not progress during Mr. Ahmadinejad's presidency. Iran says it has an undisputed right to nuclear development. It says its nuclear enrichment activities are for its own medical and energy uses. Israel, the United States and some other western nations suspect that Iran is attempting to build nuclear weapons. Mr. Rowhani began his campaign as one of eight men approved to run for president by the religious and legal experts of Iran's Guardian Council. The Council blocked more than 600 other candidates. All the women candidates were blocked, as was former president Ayatollah Ali Akbar Hashemi Rafsanjani. When two of the eight approved candidates withdrew, Mr. Rowhani became the only reform candidate. During the campaign, Mr. Rowhani spoke of Iran's separation from the rest of the world and the economic effects of the nuclear dispute. Western restrictions that limit Iran's oil exports have severely reduced Iran's foreign income. The official inflation rate is 30 percent and increasing yearly. Many young people in Iran are unemployed. Mr. Rowhani also spoke to voters of the need to free political prisoners and guarantee civil rights. He had been very critical of government attacks against peaceful demonstrations that followed the disputed presidential elections in 2009. Iranians marched for days to protest what they believed to be a dishonest vote count. News reports said Iranians seemed uninterested in this presidential election until reform leaders from the 2009 elections declared support for Mr. Rowhani. Statements from former president Mohammad Khatami and former president Rafsanjani pushed Mr. Rowhani to a strong lead. Although his campaign statements were critical of current conditions, President-elect Rowhani has been part of the country's leadership since 1979. At that time, a revolution created the Islamic Republic of Iran. Mr. Rowhani is to be sworn in on August 3. Iranians hoping for reforms are waiting to see who the new president will include in his cabinet. And that's In the News, written by Onka Dekker. I'm Faith Lapidus. We will aid their struggle against violent repression. The fire undid the work of eight months. Books are an enrichment of life. He was totally uninterested in sport.